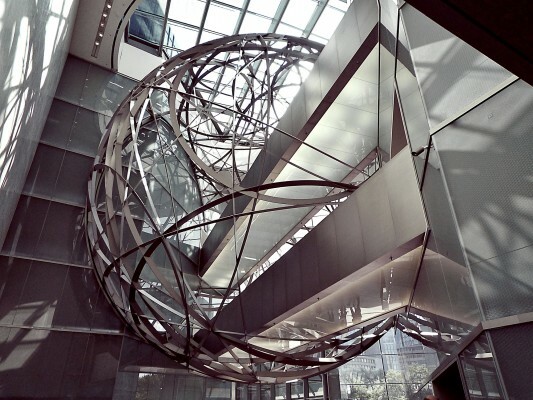 Mario Bellini’s architectural concept for the renovation and refurbishment of the Deutsche Bank Twin Towers in Frankfurt, Germany includes amongst other things a scheme to rearrange floor space and usage as well as integration of the building entrance hall into the public urban space. 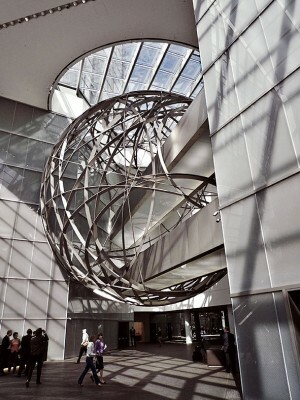 The “Sphere” is a sculpture hanging in the Twin Towers’ entrance hall. It is 16m in diameter, comprised of numerous individual, flat rings and is penetrated by two bridges connecting the two towers on Levels 02 and 03. The exact geometry and the configuration of the rings were optimized using computer-aided algorithms. B+G was also responsible for the design of the load-bearing glass steps and the bridge walkway.